Microchipping - Animal Clinic of Chardon, Inc. 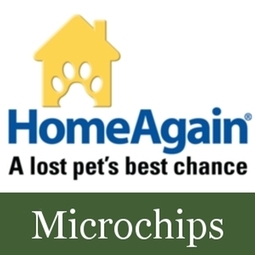 The Home Again® microchip pet identification system is a permanent method of identification. A chip about the size of a grain of rice is implanted under your pet's skin in the area of the shoulder blades. All area humane organizations scan lost pets for a microchip. The placement of this microchip can be performed during a regular appointment. Click here to schedule an appointment for your pet today!